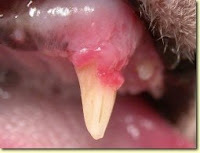 Here is another posting on dental disease because it is a topic vitally important to your pet’s overall health. I would like to highlight lesions that cats get called feline odontoclastic resportive lesions or FORLs. These are similar to human cavities in that there is a defect in the enamel of the tooth and it is very painful. If your cat is over the age of 5 years old then there is a 72% chance a FORL is present. These nasty FORLs are usually found along the outer surface of the tooth where it meets the gum line. They can present in many stages requiring dental x-rays to determine if the tooth root is involved. At the beginning stage an enamel defect is present which then progresses as the FORL penetrates the tooth and invades the pulp cavity. As the lesion develops it becomes increasingly more painful for your cat. Treatment entails a full dental exam under anesthesia and surgical extraction of the offending tooth. Veterinarians are not sure why this happens but we do know it is extremely painful and unpleasant for your kitty. While clinical signs such as difficulty eating, drooling, bleeding at the site and dropping food from the mouth may be present; some cats to not show any obvious signs of pain. You should check your cat’s teeth monthly for any obvious FORLs which appear as pink or red defects in the tooth where it meets the gum. In addition, at your yearly visit to Friendship your veterinarian will perform as thorough an oral exam as your cat will tolerate (cats can be very opinionated about who they allow to look into their mouth). As with all dental disease, FORLs can lead to increased bacteria circulating in the blood stream resulting in liver, kidney and heart disease. Finding and treating these lesions early will result in a healthier, happier kitty.